I have a love-hate relationship with the Forza franchise. I love it, because it is the racing franchise I grew up with and the many installments of Motorsport and Horizon are probably my most played racing games of all time. I hate it because it’s given me so many frustrations over the last couple of years that it occasionally made me want to launch it into the goddamn sun and be done with it. Forza Horizon 3, the previous installment in Turn 10’s open world series, was a particularly good example of this. As much as many people praised its gameplay and its graphics, I personally consider to be the worst Horizon game of the bunch. The in-game representation of Australia was just an open, flat, lifeless world with very little to do except floor it down a straight road - of which there are many. There just wasn’t anything to do after finishing it - no incentive to keep you playing. Horizon 3, while gorgeous, just felt underwhelming and empty. So you can understand my caution and skeptisicm when the next game in the series, Horizon 4, was announced. Could Turn 10 step up their game again? Would they be capable to right the wrongs of Horizon 3? Would they be able to once again make a game that would powerslide its way right into my heart? Forza Horizon 4 is probably the best open world racing game I have ever played. My expectations were relatively high, but it completely blew them out of the water. For a start, it is one of the most impressive looking games I have ever seen. It is downright gorgeous to look at, from the tight streets of a wonderfully recreated Edinburgh to the vast spectacle of the seemingly endless Scottish Highlands. And, mind you, I wasn’t even playing on Microsoft’s fancy 4K Xbox One X. I still have to make do with my trusty old original Xbox One. But if it looks this good on the old boy, I can’t even begin to imagine what the next-gen version must look like. Everything from the lighting to the reflection on cars is stunningly rendered. One particular moment that struck by me was when I came out of my property in the Highlands at night and just found myself surrounded by complete darkness. The map is roughly the same size as Horizon 3’s Australia, which is a good thing. I personally don’t think a bigger map would necessarily have been a good thing. But while the size of the map hasn’t been changed, the same can not be said for the quality. Forza Horizon 4’s representation of Britain is fantastically fun map to play around in. From the previously mentioned recreation of Edinburgh to the coastal mud roads, there is a significantly greater amount of variety in the map. Where Horizon 3 gave you a choice of ‘straight in a city’, ‘straight in a forest’ or ‘straight with lots of sand’, this new map offers you much more choice. From a winding lakeside road to a quaint countryside village to a drag strip with actual working lights, there’s something in it for everyone. Add to that that it’s not hard to find a great driving road near you (something the previous game seriously lacked) and it’s easy to see why Britain easily outclasses Australia. In the game, at least. 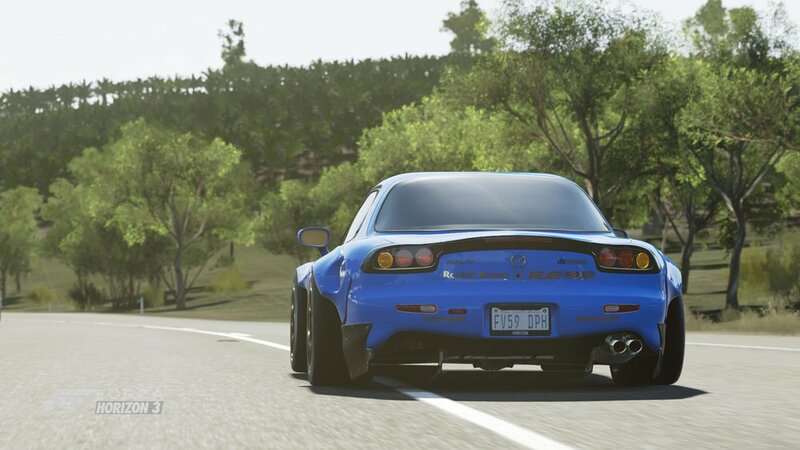 But a great road needs a great car to go along with it, and luckily, Forza Horizon 4 offers plenty of choice. The car roster now features about 450 cars, which is a staggering amount of things to drive when you think about it for a second. And much like the roads, there’s something in it for everyone. The variety of cars is truly hilarious. One moment you’ll find yourself pootling along in a Peel P50 and the next you’re doing 250 km/h+ in a GT2 RS. And with DLC now dropping weekly, instead of monthly, it’s fairly safe to say you’ll be driving for quite a while to come. Who knew the GT2 looked so good in yellow? Some of my personal favorites? The unrelentingly beautiful Eagle Speedster, which makes its return to the Forza franchise for the first time since Horizon 1 and the V10 BMW M5 E60, which makes its Horizon debut. One of my biggest critiques about the previous installment is that there simply wasn’t enough to do to keep you interested after a while. You could keep grinding away, upgrading your festivals, but it felt far too repetitive and you simply lost interested. In Horizon 4, this has been improved in a major way. Not only has the amount and frequency of races been pumped up to an almost overwhelming degree (more on that later), there’s a lot more stuff that will keep you coming back to play. Two major factors in this: Seasons and Forzathon Live. Forza Horizon 4 brings the introduction of Season to the series. Where previous games had you racing around in an eternally summer-esque setting, Horizon 4’s Britain actually cycles through summer, autumn, winter and spring as you play. In the first section of the game this cycle is based on your progression, but once you make it through the prologue, this changes. At that point, it becomes based on real time, with a season change every seven days. And a season changing doesn’t just alter the visuals, it completely changes the environment. So if you’re used to just going full throttle everywhere during the summer: too bad. Once autumn and especially winter hit, the roads become far more slippy and unpredictable. You really have to change your driving style, and in some ways, your car. During the prologue, a friend of mine wanted to wait until spring to drive the McLaren 720S he just bought, because he felt like he wouldn’t be able to drive and control it in winter conditions. With the implementation of season, Turn 10 and Playground Games have created a game that essentially changes every seven days, something that will surely incentivize players to come back. People of Surrey: you need four wheel drive for this bit. The second significant addition is Forzathon Live. In previous Forza titles, Forzathon was something that popped up every week, something that you’d do alone quickly to earn rewards. But with Forzathon Live, that has changed. It now features a challenge every hour, in which you have to work together with everyone else in the server to score points and reach a certain goal. The completion of this then grants you points, which you can spend in a special store to purchase rare items, wheelspins and cars. Because this happens every hour, that means that there is always something to do. And the co-op element in these challenges is very refreshing, because it gives you a real ‘we’re in this together’ feel. Speaking of co-op: the multiplayer system has been completely overhauled. In previous games, joining a public lobby meant accepting the risk of being smashed into by 14-years olds with maxed-out V12 swapped hatchbacks. As a result, you’d usually just separate yourself into an invite only lobby with just your friends, creating this certain sense of loneliness in your gameplay. In Horizon 4, this works differently. Whenever you head online, you automatically get placed into a server with up to 72 other players. The significant different here is that those other players automatically ghost out whenever they come near your car. This means they can’t ram you, wreck your car and cause general chaos anymore. And when you do want to play with your friends, you simply invite them into what is now a Horizon Convoy. At that point, your cars un-ghost, which means you can still play together like in previous games. The difference here is that you’re not alone - you’re together with dozens of other players who have been carefully controlled. It makes for a much better multiplayer experience. All of the banter, none of the ramming pricks. You’ll notice I’ve been very positive about this game so far. Unfortunately, if you had started to gain the impression that this is a flawless game: I have some bad news for you. As much as it is a way more involving and fun game compared to its predecessor, there are some minor things that I have to mention. For starters, the downside to the significantly larger amount of content and activities is that players (or me, at least) can feel somewhat overwhelmed by it all. Yes, there is always something to do, but the rate at which new races, stunt jumps and showcases get fired at you can get quite staggering in the early hours of gameplay. This eventually levels out and calms down somewhat, but I couldn’t help but feel pressured by the sheer amount of activities the game introduced in the early going. This is perfectly captured in a similar, but somewhat different example: Barn Finds. The barn find system that has been in every Horizon game is back (I won’t spoil them, don’t worry) but the way it’s been implemented feels a bit troublesome. Just like before, you get a barn find rumor at some point, you go look for it, find it and get the car added to your garage. And while the first two to three rumors take a while to pop up, the game goes mad with rumors after that. It came to a point where I had three rumors I had yet to search for, and when I did find one, it instantly fired one or two more at me. The pacing with these rumors feels off. I’ve found pretty much all of them now, and I’ve only been playing for about three or four days. I would’ve preferred to see it paced in a significantly slower way. One rumor every three or four days. Or better yet, why not tie it to the season system? One barn find rumor every week would have been yet another way to incentivize players to come back and to keep the game fresh. But now, I’m less than a week in, and pretty much done with collecting the rare, cool and interesting cars. And that is a real shame, in my book. Alfa Romeo 8C, Maserati Gran Turismo, Ferrari 430 Scuderia, MGB GT, Triumph Spitfire, Triumph TR3, Austin Healey Frogeye Sprite, Lotus Esprit, Aston Martin DBS, Aston Martin DB10. And I’m pretty sure that’s just the tip of the iceberg. And that’s just a shame in my book. Especially considering some of these cars, the first two in particular, sounded just fine a few games ago. Why the change? It’s a very jarring inconsistency in game with such fine eye for detail. And finally, much like with every other game these days, there’s still a fair few bugs and glitches after launch. A significant one involves the game just freezing and crashing at certain points, although it might be possible that this has already been patched. A particularly annoying bug I found is that the sound engine sometimes tends to screw up. On more than one separate occasion I found myself going on a spirited drive through the countryside, only for the car’s noise to completely freeze. Pulling over and stopping tends to solve it, but it creates a horrible noise and is very unpleasant to experience. And finally, a friend of mine has had no traffic in his game for a couple of days now. For him, this doesn’t represent much of a problem, (one might argue it’s actually better), but for those who do have traffic, this poses an issue. Because in a convoy, he doesn’t see any cars, but we do, and he’s hitting cars he can’t see. I’ve had more than one occasion where he claimed he didn’t hit anything, only to have a VW Golf or Subaru Legacy punted straight into my path at full speed. Again, it’s not a major problem, bt it’s somewhat detrimental to the immersion the game so desperately tries to keep up. But in the end, these are just minor annoyances and inconsistencies in a game that overall presents an incredibly strong package for gamers. Forza Horizon 4 is an expansive, gorgeous, entertaining, involving and incredibly fun return to form for the Horizon franchise. It was only supposed to blow the doors off, but it ended up bringing down the entire house. A quaint countryside cottage, that is.